Mackerel is a beautiful oily fish, both for its iridescent, striking skin and its rich, fishy flavour. Respected by chefs and home cooks alike, mackerel has a distinctive flavour, it looks stunning on the plate and is a great source of brain-boosting omega-3 fatty acids. Despite the benefits, mackerel is often over-looked by the buying public – it seems we are put off by its richness, fishiness and oiliness, the very traits that give it character. However, with the right cooking and flavour pairings, it is a real treat. Mackerel is a comparatively sustainable fish though the Marine Conservation Society recommend only buying line-caught, UK-landed mackerel where possible and to eat it only occasionally. Mackerel spoils quickly which, in years gone by, has given the fish a bad name. Ideally, it should be eaten on the day it is caught, unless it has been frozen, smoked or pickled. Look for firm, almost rigid, fish with clear eyes and shiny bodies. Mackerel can be cooked in many different ways, though baking, barbecuing, grilling and pan-frying are the most common. 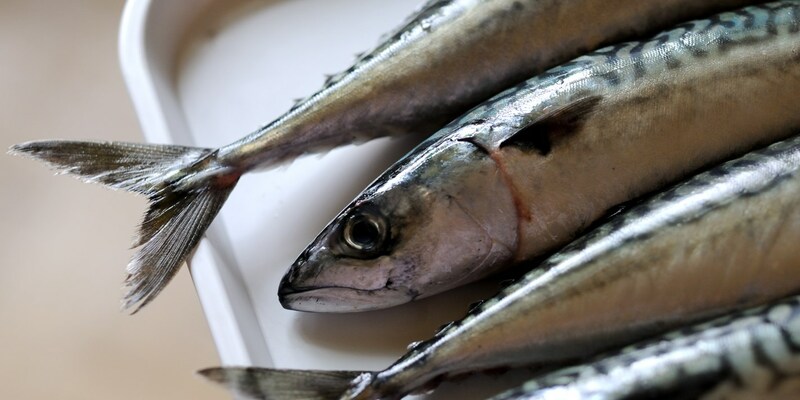 Mackerel is great in pâté, rillettes, fishcakes and burgers. Mackerel is also beautiful raw in the form of a tartare or ceviche – just be sure to buy the freshest fish possible, caught on the day of eating. Many people buy smoked mackerel for convenience and the intensity of its flavour. It is ideal for flaking into salads or for making pâté. To check if mackerel is cooked properly, make a cut in the thickest part of the fish – the flesh should be moist and firm but slightly opaque. Whole mackerel is ideal for baking, roasting or barbecuing and can be stuffed with aromatics and herbs. These methods take longer than cooking fillets – around 20–30 minutes in a medium oven – but they tend to be one-pan recipes so are fuss-free and very flavourful. Arguably the simplest way to cook mackerel is quickly pan-frying the fillets; just remember to remove the pin bones first. Barbecuing is fantastic way to cook mackerel fillets – the high heat gets the skin super-crispy and the flesh is cooked in no time. Mackerel is an excellent fish to confit, marinate, pickle or cure, as its strong flavour holds its own against a variety of ingredients. Mackerel carries a stronger taste than some other fish which is why it is often balanced with clean, soft flavours like beetroot or cucumber. Equally well matched are citrusy ingredients like lemons and limes as in Luke Holder’s Mackerel with lemon sherbet dressing and sharp fruits like rhubarb and gooseberries – these flavours help to accentuate the freshness of the fish and cut through the oiliness. Mackerel is also well suited to piquant flavours such as chilli, horseradish and capers, as exemplified by Geoffrey Smeddle in his Seared mackerel with chilli. For a more avant garde set of flavour combinations, look at James Sommerin’s dish which pairs mackerel with white chocolate, beetroot and horseradish – strange but brilliant. Avoid buttery or heavy sauces as these tend to overpower the fish.